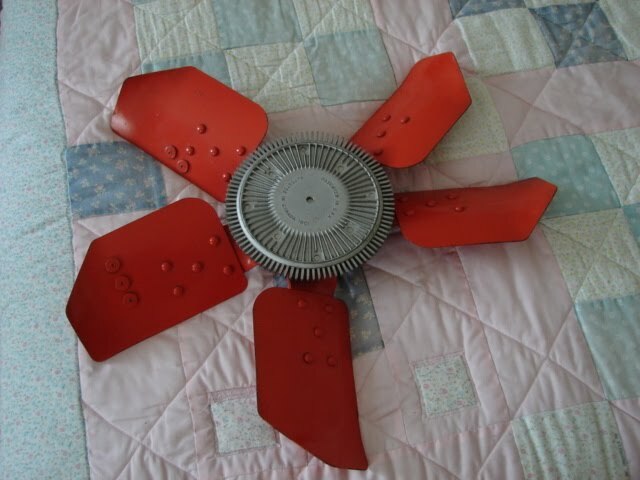 Modern cooling fan replacement for Studebakers. OK, first off, Barney's back and running fine, even in the 85+ degree weather we've been having. The new heater installation works great, doesn't drip anti-freeze on the carpet, doesn't fog the windows. Supreme! But cooling is always an issue for older cars. Most were not equipped with over-capacity cooling systems like modern cars have. My '67 Pontiac (and all Ponchos with the original PMD-designed engine) are notorious for running hot; problems include vapor lock, heat-soaking the starter and solenoid, and simple boil-out - shut the car off and hear the relief valve hiss open after a couple of minutes. Owning an old car means always having to check your radiator! Some makes can be easily retrofitted with either RPM-dependent clutch fans or thermostatic fans that decouple the cooling fan from the water pump shaft at a certain velocity or temperature, in order to permit better cooling at cruising speeds. GM cars can be easily equipped with OEM-style aftermarket or reproduction clutches. You can put a declutching fan on a Studebaker as well, but the repro clutches are pretty pricey and are not thermostatically-operated, as the original (optional) equipment was. Luckily, I scored a factory Viscous Drive thermostatic clutch and fan for Barney, which bolted right onto the water pump drive hub after removing the original fixed 4-blade fan and spacer, but not everyone is so lucky. I've seen here on the difficulty of finding the right adapters and most efficient cooling fans for bolt on ease. I just got around to inspect what my 57 Silver Hawk had on it from the Nevada desert which turns out to be a early fiberglass fan and an aluminum hub adapter S-008 made by Flex-A-Lite 25 years ago. [After a] quick phone call to their tech help and a search at http://www.flex-a-lite.com/ I was recommended to trash the old fiberglass unit for safety. I gave him all the measurements and turns out they have all the solutions. The hub part #876 allows for a 1" hub so on a stude you would need to turn it out to 1-1/16" - an easy fix.. This hub already had that treatment so I don't have to do anything there. As for the proper flex-fan - perfect match. The FlexALite 1818. 18-1/4 diamater, 2-1/2" projected width creates a constant high static pressure, low noise movement of air as it's 7 blades. I found it for only $48 at Summit Racing. Well one less thing to worry about and I hope I could help someone find the right fan. They have a huge selection of electric fan set-ups too as they claim to be the pioneer of these. They also sell a easy to mount heater unit to simplify the stock set-up. Keep 'em cool and enjoy the summer! Back in the saddle (well, driveway actually)..
Barney's back in the driveway, after spending the last two weeks at S&S having the heater core repaired. I can't remember if I posted it or not, but the Climatizer core I had rebuilt, which installation is covered in older posts here, began leaking upon its first use. Nothing worse than seeing that telltale fog appear on the windshield and seeing the yellow liquid dripping onto the carpet -- especially when you've just replaced the failed part. But leak it did, and for a few weeks I got away with driving it by closing the heater valve, but eventually the pinhole grew to the point that even the backpressure off the water manifold was causing a constant drip. This time, I went the lazy route - instead of disassembling the Climatizer and taking the core to the shop, I drove it to the shop with a printout of the heating system schematic from the Shop Manual and said "fix it, please." Unfortunately, it took nearly 3 weeks for them to obtain the right core (their supplier kept sending the wrong size), so I missed having Barney on the road on Independence Day, which I really wanted to do. But, I got him back Tuesday and have been happily tooling around since then. This morning I went to Ace Hardware for some garden soil and the shopping center's maintenance man stopped me to ask questions about him. I'm no attention hound, but I have to admit it's nice when people notice. Barney may not be the most beautiful car in the world, but he does attract people's notice! Next up on the list is getting the long-delayed rear springs installed. Details coming soon!